Hi everyone, I finally decided to start a blog! I thought it would be helpful for my friends to see some of my favorite works of art. On a personal note, I have a wonderful family, husband, 3 children and 4 grand-children. I'm trying to decide what to post first. This is a whole new world for me. I hope you will enjoy my posts and they will inspire you. 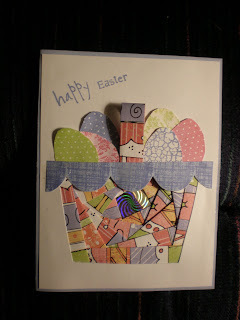 I am working on a swap card using the February Stamp of the Month, called Easter Eggs. This card is made using Daydream paper pack and the technique of Iris folding. Colors are Spring Iris, Sweet leaf, Hollyhock.